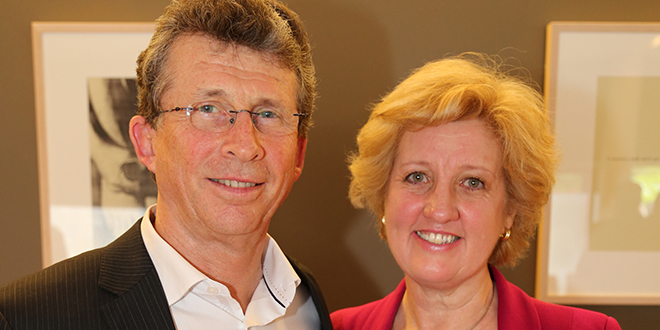 Time for change: Faith and Life executive director Geoff Gowdie, with his wife Jill at his farewell. 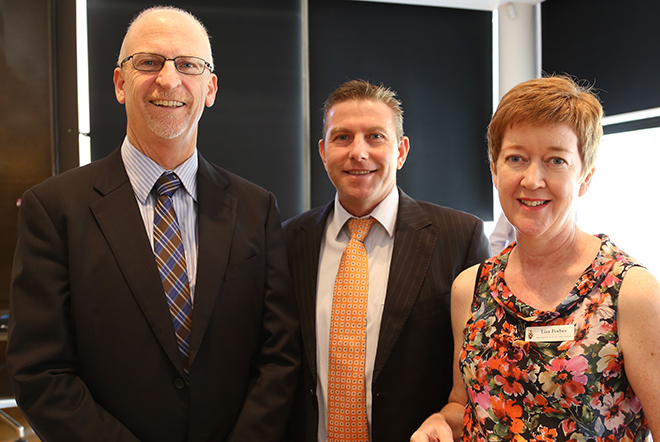 STAFF from Brisbane archdiocesan departments and services took time out last week to farewell long-serving Faith and Life executive director Geoff Gowdie. Vicar general Monsignor Peter Meneely said the gathering at the Francis Rush Centre was a chance to honour Mr Gowdie’s 23 years’ work in the archdiocese. “Geoff has figured prominently in the life of the archdiocese in all the years I have been a priest,” Msgr Meneely said. “He began working formally for Arch-bishop (Francis) Rush around the same time I was ordained a priest. Msgr Meneely said many would consider the big events that had taken place in the archdiocese as the real legacy of Mr Gowdie. Offering thanks: Archdiocesan financial administrator Jeremy Howes, Archdiocesan Services executive director Andrew Musial and project officer Lisa Forbes were among those paying tribute to Mr Gowdie at his farewell. “I think his quiet work in the background of diocesan life supporting parishes, priests and lay workers are his finest achievements,” he said. Msgr Meneely said it was good to see Mr Gowdie joined by his wife Jill, his parents and three of his four children. “Geoff’s greatest achievement in life has been his marriage and family,” he said. He said their presence and support over the years had been essential to Mr Gowdie being able to do the other things God had asked of him. Mr Gowdie said he was sad to be leaving the archdiocese. “I’ll take a short break then seek to find a match between the opportunities and my abilities and I’ll be very happy if the Holy Spirit has a hand in it,” he said. Some of the highlights of Mr Gowdie’s work with the archdiocese include Hearts on Fire in 1999, the archdiocesan synod in 2003, formation of the Faith and Life Vicariate (2005), development of Santa Teresa Spirituality Centre, Ormiston, (2009) and Pray 2010.